As a celebration of Robert Boyle and to promote the availability of EU funding for Irish Scientists, this week saw the launch of talktoEU.ie's #TWEETSINSPACE campaign. 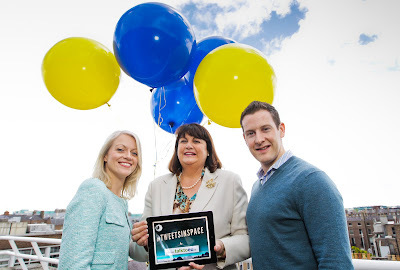 The campaign involves a balloon, Junior Cert Physics and tweets from Irish people. talktoEU.ie, the public information initiative funded by the European Commission, is tasked with highlighting the significant funding currently available to Irish scientists through EU programmes. #TWEETSINSPACE is designed to communicate this to young Irish people through discussing the benefits of EU funding in science, innovation, and research. Of course the campaign also celebrates Robert Boyle, who is one of Ireland’s most well known scientists, by demonstrating the impact he has made on the scientific world and testing the limits of Boyle's world famous law. European Commissioner for Research, Innovation and Science Máire Geoghegan-Quinn said: "The European Union needs a million more researchers by 2020 if we want to stay ahead of the game in research and tackle major issues like climate change and food shortages. EU funding is supporting many young scientists to further their careers and really make a difference." The weather balloon that will travel to the edge of the earth’s atmosphere will have Boyle’s face printed on it and will be filmed as it expands until it eventually bursts, as Boyle's Law predicts. The experiment will also display a number of tweets from the public when it reaches the edge of space via a screen attached to the balloon, making them the highest tweets ever sent in Ireland. Weather permitting, the balloon and it's payload will launch on September 10th. To find out more about this event, and have your tweet displayed, send your tweet to #tweetsinspace or visit talktoeu.ie.